Meditation on the Hebrew letters is not so much a human activity as a supernatural act, in which we break down the barriers of our natural existence and reach into the divine world. Each letter is a garment provided for our benefit, so the creation energy they house will be intelligible to us. Concentrating on the letters, their shapes dissolve and the Holiness in the letters is revealed. In Hebrew prayer, an extended meditation on the letters and their combinations, we carve them with breath and set them in the mouth in 5 places, to carefully pronounce each letter of the 5 families. We carve them with breath, contemplating each letter carefully, concentrating on the breath that is exhaled while it is pronounced. We set them in the mouth, meditating on the place in the mouth with which the letter is pronounced. While speech itself involves Binah consciousness, the pronounciation of the letters is an automatic activity, and hence, it involves Chochma consciousness. With this exercise, the initiate learns to make use of the letters with Chocma consciousness, and by pronouncing them physically, clothing them in Binah. It is through this exercise that we learn to use the letters as Paths of Wisdom. The mouth speaks, while the Spirit provides the thoughts. Surrendering to the letters, the intitiate is like a torch, fueled by Holiness. Noah is told to "put a window in the ark" - but this is the simple translation. "Tzohar" means to "illuminate, make clear, to press olives, or to dry fruit in the sun." The word "teva," which means ark, also means "nature" and "word." Midrash says the Tzohar was a glowing stone that contained a spark of the original Light of Creation, which was given by the Creator Before Time to Adam and Eve as they left Eden - these ideas weave together to mean "Illuminate the Word." The gematria of "tzohar" is 295, which is the same numerical value as "menorah" - enhancing the symbolism of clarifying or illuminating the Hebrew letters, especially when it is revealed how perfectly they align with the branches of the Menorah. 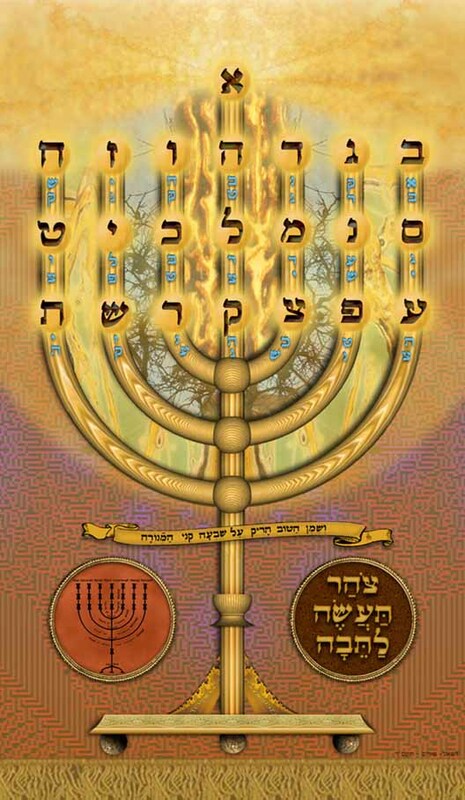 "V'shemen ha tov tariq al sheva k'nei ha Menorah" - [the words in the ribbon] mean "and pour the good oil on the seven branches of the Menorah" - which is the act of annointing - Moshiach - Messiah. When combined with the fact that "tzohar" also means to press olives, the source of the "good oil" - the connection becomes even more pronounced. The letters here illustrate a continuous line of transmission from the most transcendental - Aleph - to the most material - Tav. The Aleph at the top resides at the nexus between the infinite and the finite, where pure undifferentiated essence begins to divide into the "olam ha pirud" - the world of distinctions, and where the world of differences unifies into the Aleph and merges with the transcendent. Accordingly, the base of the Menorah is the most concrete and real part of the image. Since the entire alphabet is presented here, all of the words of Torah, Talmud, and Siddur [actually any Hebrew word] can be permuted from the array. The blue letters are the first letters of the words of "Ana B'Ko-ach," a deeply mystical 42 word meditation from the Siddur, made of up seven lines, six words each. Many Jewish prayers, psalms, and other meditations were composed as alphabetic acrostics, that is each verse begins with a letter of the Aleph-Beis, from Aleph to Tav. Rabbi Bezalel Ashkenazi says that to arrange one's prayers and praise with all 22 letters symbolizes completion, and that the Creator is praised with all of the sounds that we are capable of uttering. Using the letters like rungs of a ladder, we connect Above to Below, to blend the Transcendental and the Immanent, the Spiritual and the Physical, the Abstract and the Concrete. In fact, the gematria of "sulam," "ladder," is 130, the same as "Sinai" - the mountain where the Cloud of Glory touched the Earth. There are also 130 words in "B'rich Shemei," a passage from the Zohar that is read at the recieving of the Torah. Bereshis (Genesis) 28:12: "And he dreamt, and behold! A ladder was set earthward and its top reached heavenward; and behold! angels of the Creator were ascending and descending on it." 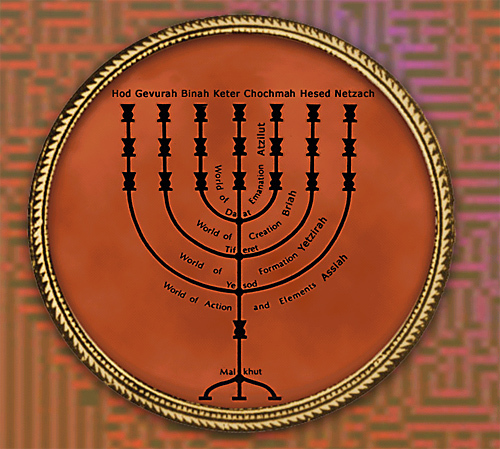 Below is shown how the 4 Worlds of Emanation and the Sephirot are mapped on the Menorah. 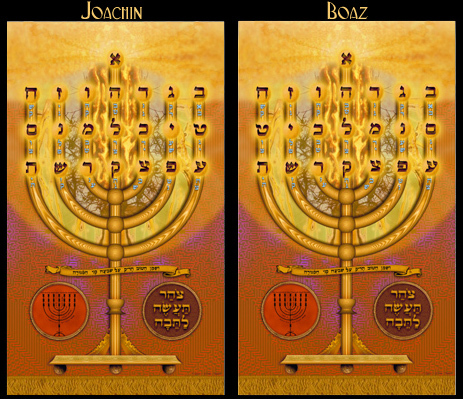 In Joachin, letter beit follows alef and is on the right because Hebrew is read right to left. All three lines are read right to left, normally.